Michael Rubin knows how to throw an epic pre-Super Bowl bash. 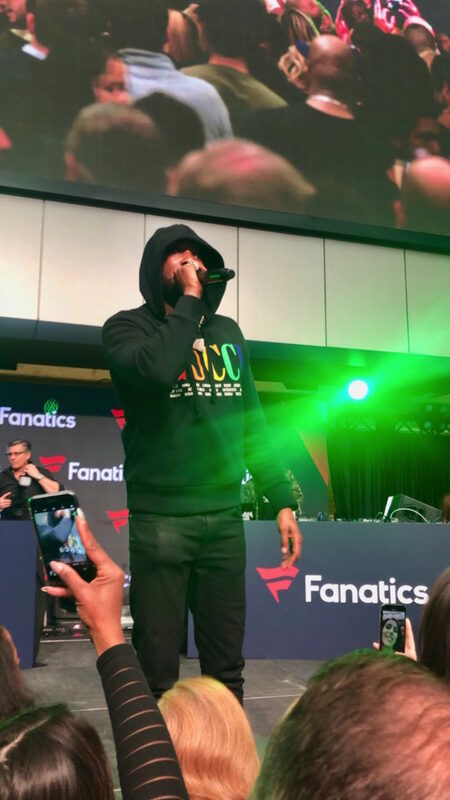 The Fanatics founder brought his annual Fanatics invite-only day party and several of his celeb friends with him to Atlanta to kick off Saturday’s festivities. 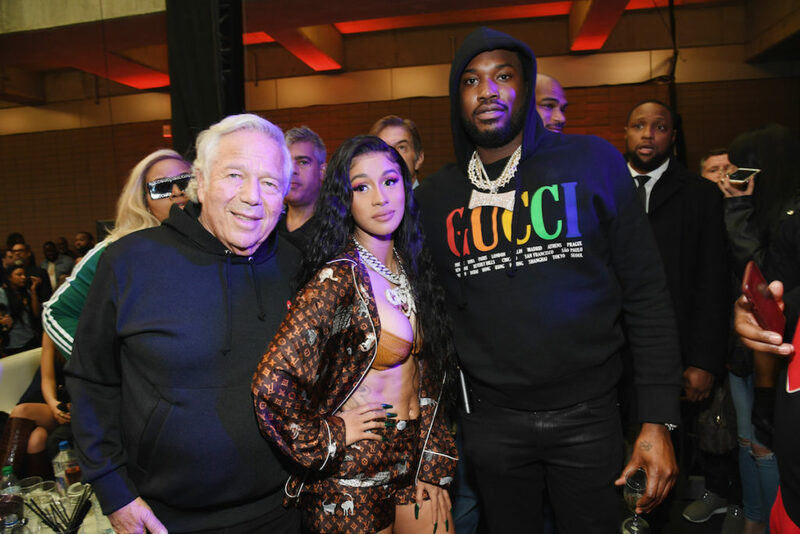 As the fete went down at the College Football Hall of Fame, Cardi B and Meek Mill crushed the stage with an epic performance, Patriots owner Robert Kraft showed off his dance moves, and Meek made a hilarious announcement. Take a peek at the 5 things you need to know about the Fanatics Pre-Super Bowl Day Party! 1. Meek Mill Took Lori Harvey Off His Wish List: When Meek Mill first dropped his album Championships, there was a ton of chatter about song “Going Bad” when everyone heard this line: “I put Lori Harvey on my wish list.” A Twitter debate soon ensued with whether or not he was referring to Steve Harvey’s step daughter or Black KKKlansman star Laura Harrier, after both starlets posted videos of themselves dancing to the song on Instagram and assumed he said their names. 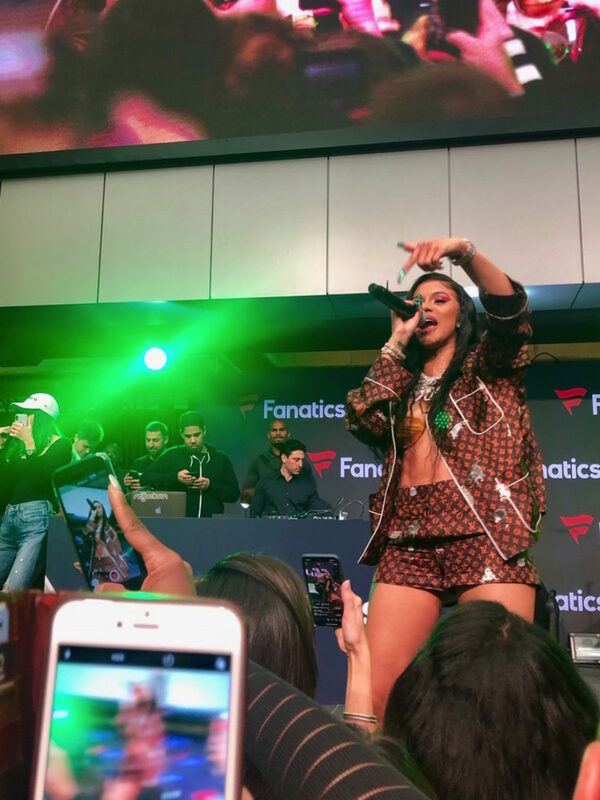 As Meek took the stage and performed the song at Fanatics, he switched that now famous line to “I took Lori Harvey off my wish list. That’s what Trigga Trey wanted for Christmas.” And with that one line, the audience lost their minds (Harvey recently went public with her boyfriend Trey Songz). 2. Cardi B Almost Took a Spill: Slips happen. We’ve all been there. But, have we ever recovered from an embarrassing trip up with the pizazz of Cardi B? Not even. As the tk rapper winded her hips in a monogrammed Louis Vuitton jacket, matching shorts, and white booties during her “Money” performance, she tripped up, fully recovered, and made a joke out of it in less than a minute flat. “Okay….somebody spilled something,” she said with her signature laugh, as the audience laughed with her. “I think it’s baby oil. Someone’s trying to kill me.” And with a flip of her long waves, who went on to her next song. “Girl you are snatched!,” an audience member yelled to her, as Cardi continued to flash her abs and pump the crowd up with an epic performance of “On Me” with Meek Mill. Cardi just gave birth to her and Offset’s daughter Kulture Kiari Cephus six months ago. It didn’t look like she had ever birthed a child. 3. Patriots Owner Robert Kraft Has Moves: Say what you will about the Pats, it was tough not to crack a smile when their owner, Robert Kraft, let all the way loose as Cardi B performed “Money.” Clad in a black sweatsuit, the 77-year-old sports mogul hopped away from the side of the stage and straight onto the stage with Cardi, and showed off his dance moves as he bounced around and threw his hands up. The audience went wild, cheering him on as he danced and almost backed it up right into Cardi. 77 where. 4. The Event Was Star-Studded: The fete was low key, with attendees mixing and mingling before the performances began.with cocktails from the open bar and plates of free grub. As the day party went on though, Kevin Hart, Emily Ratajkowski and her husband Sebastian Bear McClard, Peyton Manning, and many more stars and sports personalities arrived. 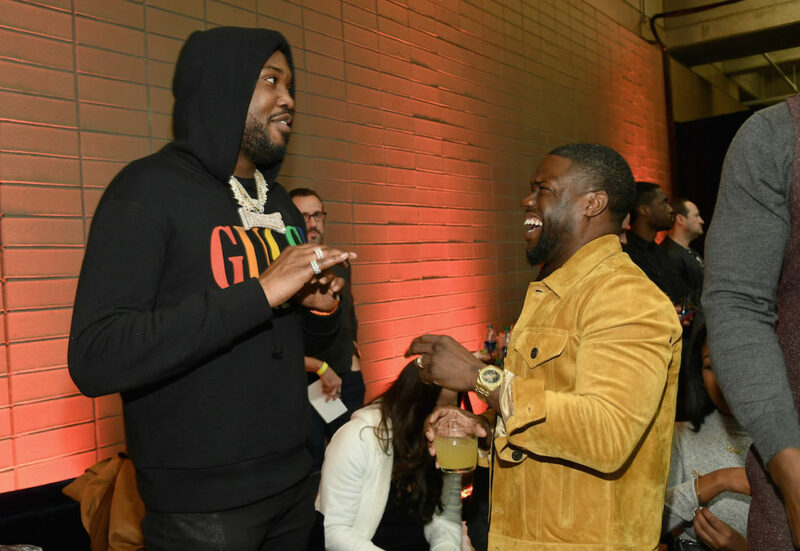 Before Meek and Cardi set off the day with their killer performance, Ratajkowski, Hart, and more raised their glasses for a champagne toast at the only table on stage. Jon Bon Jovi, Yo Gotti, and Van Jones were on hand for the event too. 5. 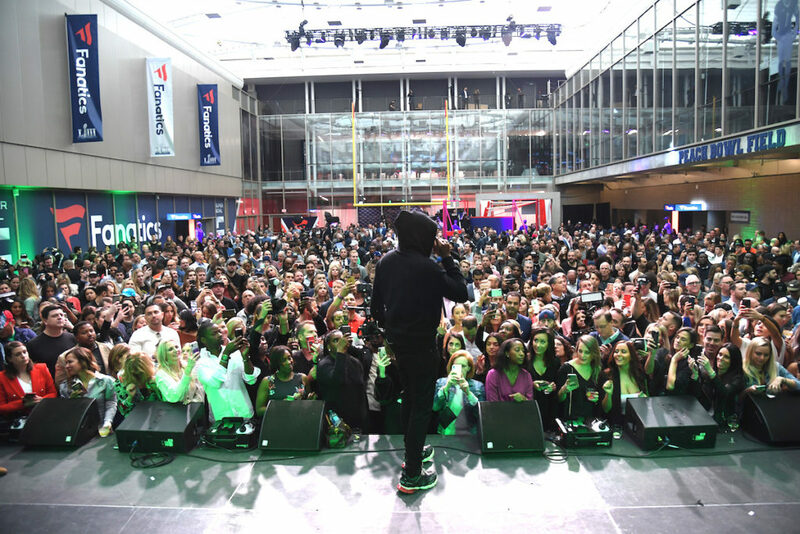 Michael Rubin Commemorated Meek Mill’s Prison Release: The event marked the 1-year anniversary of Meek’s prison release, which Rubin made sure to mention and celebrate. Before Meek and Cardi took the stage, Rubin talked to the crowd about the importance of criminal justice reform and how “special” it was to have Meek at the event, particularly because they were doing everything they could to get him out of prison just a year before. 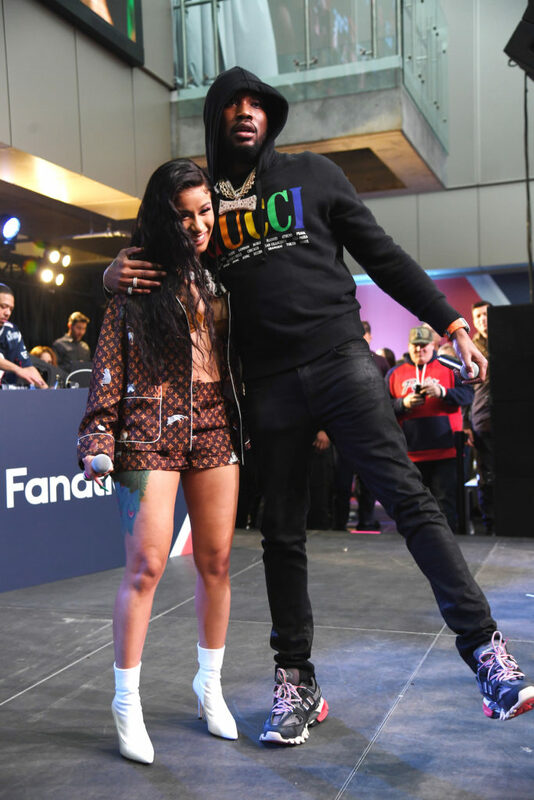 The Philadelphia 76ers co-owner also shouted out Cardi B and Hart for their generous donations towards Meek’s release, acknowledging that Cardi B was one of the first to contribute. Stay tuned for more details from our fave Super Bowl events!